1Publisher's Note: Products purchased from Third Party sellers are not guaranteed by the publisher for quality, authenticity, or access to any online entitlements included with the product. This up-to-date self-study program gathers a wide variety of exam-focused resources to use in preparation for the latest edition of the challenging CompTIA Cloud+ exam. 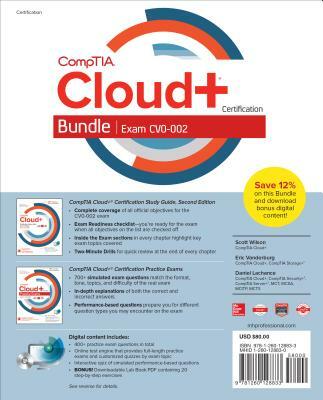 CompTIA Cloud+ Certification Bundle (Exam CV0-002) includes two books with supplementary practice exam software and bonus electronic content--all at a discount of 11% off the MSRP. The package shows you how to set up, secure, and manage cloud technologies and infrastructures. As a course for study, you can first read the CompTIA Cloud+ Certification Study Guide, Second Edition--an in-depth exam review that fully covers every objective for the exam. Then, you can test what you've learned with the more than 600 accurate practice exam questions and in-depth answer explanations featured in CompTIA Cloud+ Certification Practice Exams. Finally, the Total Tester exam engine included with both books provides full-length, timed simulated exams or customized quizzes that target selected chapters or exam objectives.